Any home needs to be vigilant about how they use their smoke alarms - this means carrying out regular checks of a smoke alarm’s safety, and to avoid making mistakes when it comes to replacing batteries and taking batteries away from an alarm for an extended period of time. Even if you’ve had no reason to use a smoke alarm for a long time, it’s still worth installing one on each floor of your home in case something does happen, from smoke problems to a full blown fire. There are some simple routines that you can get into for ensuring that your smoke alarms are working properly - don’t remove the battery from a detector to use in something else (in most cases smoke alarm batteries only work for alarms), and if you do need to replace a battery, do so as soon as possible. Most batteries last for about a year, and will notify you of their need to be changed by beeping. In any case, you should test your smoke alarm once a week by holding down the main button; you should also dust and clean out the inside of your smoke alarm twice a year, and should change the whole device every ten years or so. 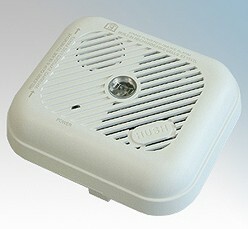 If your smoke alarm does go off and keeps on ringing, you should consider where you’re placing your alarm, and what you can do to stop it from going out - you may have your smoke alarm placed too close to your oven, as well as too near to steam from baths, or where cigarette smoking is entering into the device. You should make sure that alarms haven’t been accidentally damaged or removed as part of painting or other renovation work. Uncertainty about whether you’re doing all you can to make your home safe from fires can be dealt with by ordering a free fire safety inspection from your local fire station or council; new smoke alarms can be fitted, while you can also have an inspection to check that you aren’t at risk of any fire damage as the result of faulty gas or electric connections. Emergency exits and other entrances should also be checked in the event of a fire. One smoke alarm that can solve a lot of these problems is the Aico Ei151TL fire alarm - this is set up with a 10 year rechargeable lithium cell battery - while the smoke alarm runs off the mains, the lithium battery acts as back up, and can work even if your mains power gets cut. Similarly, the Ei150 range can be connected to up to 12 different alarms around your home, and comes with a 5 year guarantee of use. Taking care to inspect and maintain your smoke alarms shouldn’t take up too much of your time, and will not be something that you notice on a regular basis. However, by remembering to test they work on a regular basis, and by cleaning and replacing batteries on a semiannual to annual basis, you can ensure that your home is protected from smoke and fire. Sarah blogs about safety in the home, and also likes to keep up to date with all the new gadgets you can find for preventing fires and other dangers. At the moment she’s particularly pleased with the Aico Ei151 series smoke alarm.